It was a cloudy October day as I drove down backcountry roads, reminiscing about a time when this drive was once quiet and peaceful. With the windows down, I could hear the sounds of nature as the trees greeted me. Reality slowly sunk in about how times have changed when I saw a long line of bright red taillights up ahead. Traffic came to an inevitable halt. I sat there waiting for what seemed like forever, pondering why so many cars were on the road. I felt as though someone were tapping me on the shoulder, trying to get my attention to look up, look out. I did. There he was, a magnificent red-tailed hawk, perched on the power lines next to a sparrow, waiting, for what, I did not know. As he gazed out over the land, facing a newly constructed childcare center, I wondered why I had never seen him near this road before. What must he be thinking? My eyes focused back at the sign below him. In big bold letters, it said: “Commercial Land-For Sale.” Traffic picked back up. The “for sale” signs continued down the road, now visible on both sides. It did not take long for me to realize that his habitat was being divided by new development. This experience marked the beginning of a personal journey, an awakening to how life in the skies is connected to choices we make on the ground. On my return home that afternoon, the thought of this enormous bird kept creeping back into my mind. 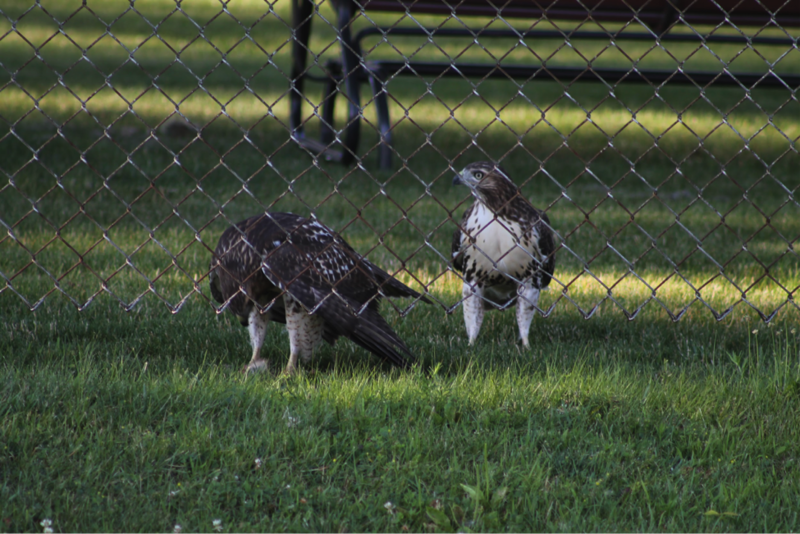 Were red-tailed hawks new to the area or was I so wrapped up in my own life that I didn’t even notice? For the next eight months, I spent time learning about these birds of prey and how they were attempting to coexist in a world full of humans. I often drove on the outskirts of town, eyes wide open, with a mission to find every red-tailed hawk that I could. My mind raced with ideas about how to share their story with my friends, family, and neighbors. If only I could get up close enough for that perfect picture, I was positive that everyone who saw the evidence would be intrigued by their presence. That day came sooner than I imagined. As I woke up one warm June morning, I could hear the birds chirping more than usual. I went to the bathroom window to see what was happening. 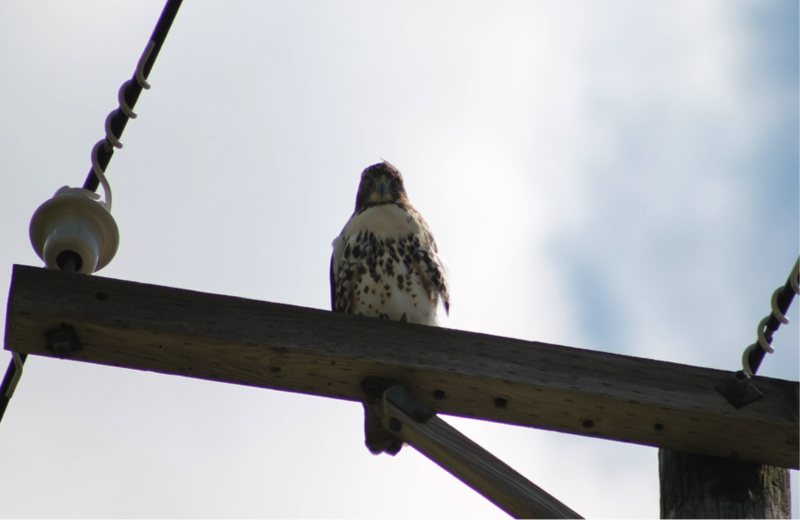 Was that really a red-tailed hawk sitting on the power line in my side yard? I rubbed my eyes to make sure I wasn’t dreaming. But there he was, my very own red-tailed hawk visiting me. I raced to my room, grabbed the camera and darted out the garage door. I felt like an Olympic sprinteras I sped down the sidewalk in record time. Only then did I realize I was still wearing my pajamas. 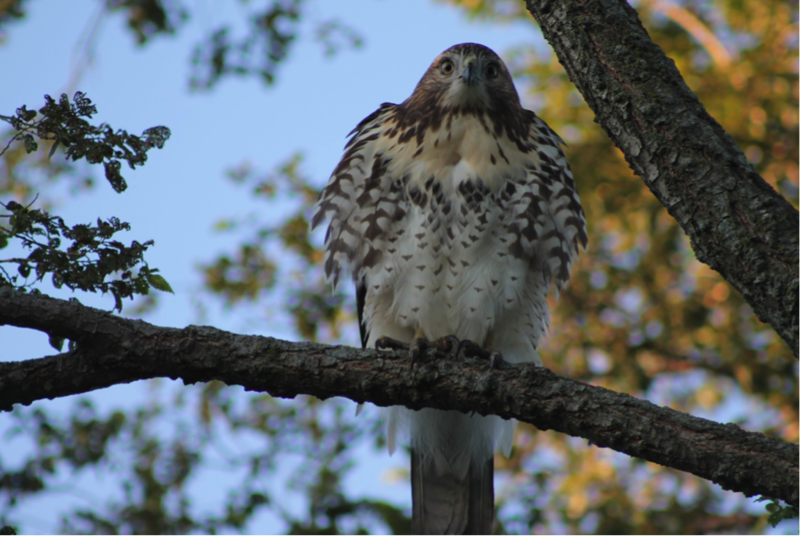 When I reached the hawk, I stared in awe, pulling my camera up to take a picture. In that moment, he took flight. I held my breath as his wings spread gracefully and he flew over my head, calling out. What was he doing in the neighborhood? He must have been hidden in the mini-forest that my neighbor calls his yard. 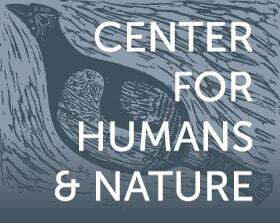 This was the perfect calling card for a red-tailed hawk. The large trees situated along the street allowed him to perch and watch the activity below. I kept him in my sight and became a woman in hot pursuit of solving this mystery. 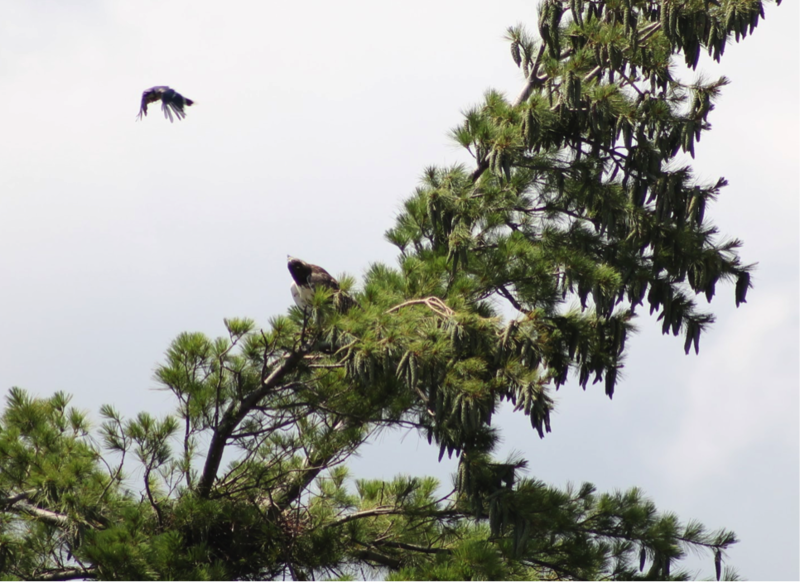 I ran across the road and down two blocks, watching him land on top of the neighbor’s pine tree. Blue Jays were dive bombing him. As I sat there taking pictures, I spotted two other red-tailed hawks flying in the near distance, likely his family members. Just then, a police car pulled up alongside me and the officer asked what I was doing. What kind of person stares at their neighbor’s house and takes pictures in her pajamas? Thankfully, the officer was understanding. More than understanding. She sat in her squad car, taking pictures of her own. The next few weeks were busy. I recruited my children to support my red-tailed hawk search, as though we were covering a breaking story for a local news channel. They would race by bike, locating our new community residents and I would run after them. On one adventure, I heard my son yelling, “Mom, hurry up, we hit the jackpot! The whole family is sitting on the school’s rooftop!” I was like a paparazzo, with my camera snapping away, caught up in the moment of stardom. 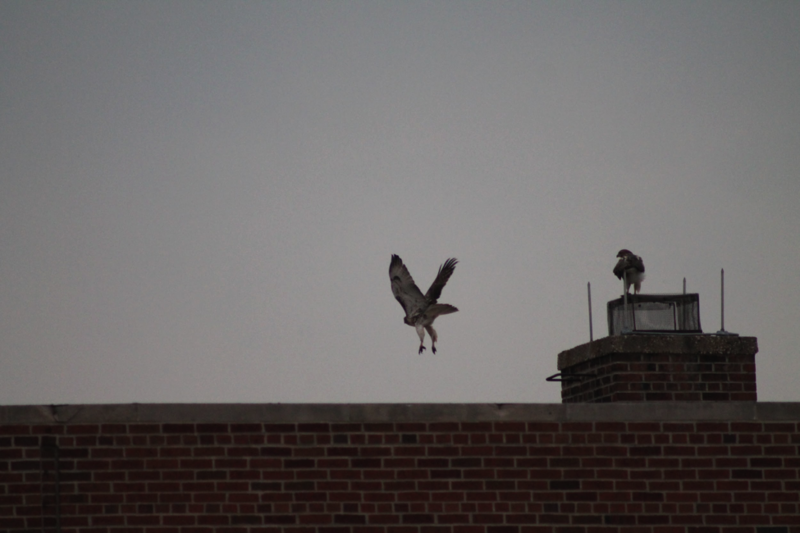 How many times could I take the same picture of a family of red-tailed hawks? I couldn’t be sure, but I just knew that the next picture must be better than the last. As they sat there, perched in their elegance, staring back at us with unspoken words, it was as if we understood one another. Then, something caught their attention and instinctively they raised their wings and were gone. We found them three blocks later in a neighbor’s backyard, feasting on what they must have spotted from the school rooftop. They were using the neighborhood to hunt for prey, and by all indications, they were thriving. Unfortunately, as new construction consumes the empty spaces of land that still exist, it wipes out the remaining suitable vegetation imperative for red-tailed hawk survival. However, we have the power to make a difference in our communities. I found out that residential yards alone constitute one-third of landscapes that cover urban areas. 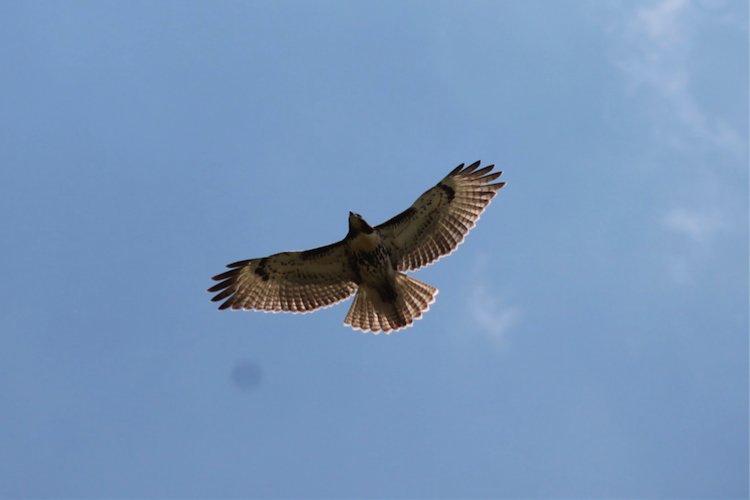 Designing the perfect yard with native vegetation helps provide crucial corridors, connecting patches of broken landscape for red-tailed hawks as well as other wildlife. As our neighborhood red-tailed hawks linger in the sky, intently watching our every move, I often wonder which yard must seem like the perfect haven. Is it the one with the sycamore or the paper birch, or the one with the tall oak trees that tower above the rest? I cannot be sure, but I do know that red-tailed hawks are moving in and it is time that we welcome them to the neighborhood. There are days when I envision my community rallying around the wellbeing of the red-tailed hawks of our region—perhaps winning the esteemed Nobel Peace Prize for their dedication in providing sustainable backyard habitats with native vegetation. Then there are days when I am more grounded and realize that I am only one voice. I’ll keep spreading the news, in the hopes that my voice could be the beginning of greater things. As this journey continues to unfold, I’d be proud to be considered their wingman or wingwoman—so long as I can help them fly through the neighborhood. 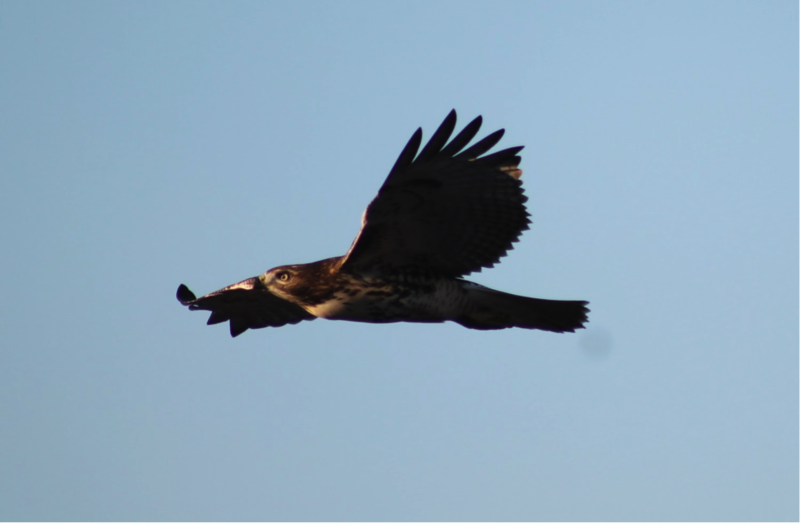 To learn how you can help be a wingman or wingwoman for red-tailed hawks and support conservation efforts for other birds of prey, please visit Red Hawk Rocks blog and the Raptor Conservation: Birds of Prey website for additional information. Kristi Rivas is a currently following her passion in the field of conservation as a graduate student with Project Dragonfly at Miami University of Ohio. She has been inspired by avian species attempting to co-exist in a human-dominated world and hopes to engage her community to take action for a sustainable future.